A short biography of French anarchist revolutionary and First International activist, Charles Alérini. Charles Alérini was born at Bastia, Corsica, on 20 March 1842. He became a teacher and taught first at the lycée of Marseilles and then at the College of Barcelonnette in southern France. He became a member, then corresponding Secretary of the Barcelonnette section of the International Working Men's Association, which led to him being suspended from his job and arrested a few days in April 1870. Moving to Marseilles, he became director of the paper Rappel de Provence. In Marseilles he worked closely with his fellow Corsican Bastelica. He was arrested on 20 May for membership of a secret society (the International). He took part in the occupation of the Hotel de Ville (the town Hall) and the organisation of the short-lived Marseilles Commune of 8 August 1870, alongside three other radicals called Gaston Crémieux, Combes and Matheron. Imprisoned after its defeat, he was liberated on 4 September with the declaration of the Republic. When Russian anarchist Mikhail Bakunin moved to Marseilles between October and November 1870, Alérini made his acquaintance and became a member of the revolutionary group that the former had founded. When Bakunin risked arrest, Alérini was instrumental in his escape. Alérini served on the Insurrectional Departmental Commission during the revolutionary days in Marseilles in March 1871. Active, energetic, intelligent, he put all his knowledge at the disposal of the International, during the Marseilles Commune organising the armed resistance, requisitioning rifles and ammunition, and taking one of the most active parts in all the acts of insurrection. On 4 April, he was one of the last to flee the prefecture after everyone else had left. With the defeat of the Commune he managed to escape to Spain in April 1871 where he continued his activity. He was condemned to death in his absence on 24 January 1872 (he was finally pardoned in September 1879). 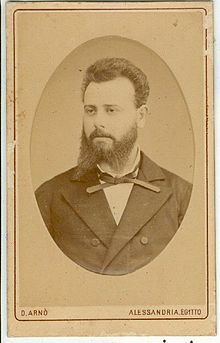 He became one of the group around Bakunin in the short-lived faction within the IWMA , the International Alliance of Socialist Democracy, around December 1871 and was active in it on Spanish, French and international levels. With Paul Brousse and Camille Camet and others in Barcelona he founded the Comité de propagande révolutionnaire socialiste de la France méridionale (Committee of Revolutionary Socialist Propaganda for Southern France) which in 1873 published the paper La Solidarité Révolutionnaire (10 issues June-September) and which employed the term “an-archie” to describe its ideas in a signed programme. This group attempted to rebuild the movement in southern France and launch a new insurrectionary movement but soon Brousse moved to Switzerland and Camet returned to France leading to the cessation of the paper. He was a delegate for the Spanish Regional Federation to the Congress of the International at the Hague where he signed the declaration put forward by the Bakuninists and where Bakunin and Guillaume were expelled from the International. On his way to the Hague, he had stopped off in Vitoria to pass a letter from Bakunin to the Spanish activist Anselmo Lorenzo. Subsequently he attended the St Imier Congress where he was one of its three secretaries. He was expelled from the International by the General Council controlled by Marx on 30 May 1873. He was again a delegate for the Spanish section, with four others, and for several French sections at the Geneva Congress (6th Congress of the Anti-Authoritarian International) of September 1873 with Jean Louise Pindy, Montels and Perrare. After the Congress he visited Bakunin in Berne with Pindy, Brousse and the Spaniards Farga Pellicer and Vinas. Alérini returned to Spain where he was very involved in the activity of the Centre of Workers Societies. The revolutionary events of that summer resulted in Alérini and many other Spanish internationalists being imprisoned, he himself being arrested whilst making a propaganda tour. He was put in the Cadiz jail. Bakunin was very anxious that an attempt should be made to free Alérini from prison. He asked Italian anarchist Errico Malatesta to help this come about. He remembered the great services Alérini had rendered him in helping him escape from Marseilles. "Of this journey which took place that autumn or a little later Malatesta speaks in a humorous spirit. The local comrades at Cadiz considered the rescue easy. He was immediately admitted at the prison as if he had entered a hotel and passed the whole day with Alérini and 30 or 40 comrades, prisoners from Cartagena, Alcay and Cadiz (1873). Finally, Malatesta boldly asked the chief warder to let Alerini walk out with him to see the town. Some pieces of gold jingling in his hand disappeared in the other's palm and next day Alérini, in company of two warders, was permitted to join him. The local comrades had arranged for a ship, the warders were made drunk, but - Alérini hesitated and would not go. There was nothing left that night but the considerable trouble for Malatesta and Alérini - to restore their drunken warders to their prison home. On the day following Alérini seemed more disposed to go away, this time a single coin of gold and one warder were sufficient, a sober man this time, but upon whom a sleeping draught appeared in the evening. Alérini was free to go and seemed determined to leave, but was found lingering in a room outside and simply would not go - so Malatesta gave it up. Alérini may have had a local sweetheart or was disinclined to re-enter revolutionary life; his time was over in fact." After having served his time, Alérini was a member of the Federal Committee of the French Federation of the International, with Francois Dumartheray, Brousse and Pindy in April 1877 and which held a conference on 19th August 1877. After this he moved to Cairo in Egypt, where he disappeared from the revolutionary movement, leaving no traces of his subsequent life. James Guillaume in his Souvenirs talks of the warm heart, rectitude, and uncomplicated courage of Alérini.